This tour is a cultural mix of volcanic beauty, ancient Mayan ruins, sparkling Caribbean beaches and colorful colonial towns. Traveling from Mexico’s famous beachside city, Cancun, to the idyllic shores of Playa del Carmen, this trip combines anitquity with adventure. Experience an official new Wonder of the World, Chichen Itza, in Mexico and learn Mayan secrets as you watch a dazzling sunrise over the Tikal pyramids. Dive into the clear pools beneath Palenque’s waterfalls and savor spectacular jungle views from atop ancient ruins. Breathe crisp air and meet locals in the Chiapas highlands. Soak up San Cristobal’s relaxed atmosphere. Enjoy fun in the sun at Playa del Carmen. 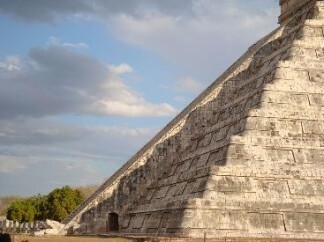 Discover the Mayans is a great chance to learn history a enjoy the surf & sun. You are met on arrival at Cancun Airport and transferred to your hotel You can arrive at any time on day 1 as there are no activities planned until the important welcome meeting tonight. Your leader will leave a note at reception telling you where and when this important meeting will take place. Please ask a member of reception for this information. After the group meeting there is the option of joining the group for dinner. Cancun is unlike any other place in Mexico. A haven for sun-worshippers, retirees and American spring-breakers, Cancun is full of resorts, bars and shops and there is always something going on. It’s strange to think that in the 1970s this was a small fishing village. It’s a fun place to check out but don’t take it too seriously. If there is time, head down to the beach for a frolic in the surf before playing ‘spot the MTV camera’ in town. The city of Chichen Itza was founded in 432 and aligned with the Toltecs in the 10th century. In the 13th century civil war broke out and the city went into decline. In more recent years it has been declared a UNESCO World Heritage site. The city is one of the best examples of Mayan architecture and the piece de resistance is El Castillo (great castle), a 91 stepped pyramid. El Castillo is best known for its amazing carved snakes. The temple is aligned so that the diamond back rattlesnake carved along the staircase will be hit by the sun during the spring and fall equinoxes. With the play of light the snakes look as though they are ascending or descending the staircase. The Ball Court is another impressive site and the largest of its kind. Playing on a field much longer than a football field, two teams would try to score goals with a ball using only their elbows, wrists and hips. This was a sport the Mayans took very seriously and it was often used to settle disputes. Some believe the losers were even put to death. Another site of interest is an impressive sinkhole, just a short walk from the main plaza. It’s said that ceremonies of sacrifice and offering to the Mayan rain god were made here. We travel to Palenque. The encroaching jungle trying to reclaim the ruins of Palenque is almost as fascinating as the ruins themselves. The ruins rise up above the wilds, but a climb to the top of any of the towers reveals the great Yucatan plain just down the road. Stroll around some of the 200 buildings that make up the city and admire the temple walls, sculpted with images of gods, rulers and ceremonies. Imagine yourself in the shoes of the archaeologist Alberto Ruz as you walk down the steps to Pakal’s tomb. Pakal was the greatest of all Palenque’s rulers and in 1952 Ruz unearthed his tomb, discovering Pakal’s sarcophagus decorated with the richest offering of jade ever seen in the Maya world. Crossing into Mexico’s highlands we travel to the colonial city of San Cristobal de las Casas (approx. 5 hours). Known for its ties to the Zapatista revolution, San Cristobal is an architectural gem and oozes provincial colonial charm. The outlying villages mix tradition with modern religious beliefs with some unusual results. If you take a day trip to San Juan Chamula, make sure to visit the church. The floor is covered with pine needles and the air heavy with incense. Shamans come here to carry out cleansings using firewater, ancient prayer and sometimes chickens. There are also markets to visit with colorful handicrafts for sale. Today we travel to Panajachel (approx. 10 hours). Enjoy the view from the shores of Guatemala’s most beautiful lake, Lake Atitlan. Ringed by volcanoes and colourful villages Panajachel is a great base to explore the best of this region. Panajachel is a relatively modern town with paved streets and many shops, but it is still easy to explore by foot. Wander the back streets with their many churches to soak up some old world charm. While in “Pana”, we venture out by taxi-boat to visit a women community cooperative dedicated to preserving the skill of spinning natural cotton thread while giving local women the opportunity to sell their creations directly to the public. En route to Antigua we visit the bustling morning market at Chichicastenango, overflowing with colorrful handicrafts and intricate weavings to fill up your backpack. After an approximately 4 hours travel time we arrive in Antigua – once the most important city in Central America. In 1773 the city was destroyed by an earthquake, but many of the colonial buildings have been carefully restored and the architecture from its glory days can still be admired. Today we visit a small coffee farm. Roll up your sleeves and work side-by-side with coffee farmers in their daily coffee processing, pick, pulp, ferment, wash, dry, trilla, sort, and grade the coffee (depending on the season), roast coffee over an open fire and grind by hand on a grindstone before sampling your handiwork. This farm forms part of an organization that helps entrepreneurial men and women from disadvantaged communities to establish independent, sustainable businesses so that they can improve their living conditions and stimulate their local economies. Today we travel to San Ignacio (approx. 3 hours) in the forested hills of the highlands. Surrounded by fast flowing rivers, waterfalls and Mayan ruins, San Ignacio is an ideal base to explore the region. Some of the optional activities are a day trip to Xunantunich, an impressive Mayan ceremonial centre with panoramic views over the countryside. The east side of one of the temples has a unique stucco frieze and the central plaza has three carved stelae. Getting to the site is half the fun: you’ll need to take a hand-cranked ferry to cross the river. It is also possible to take a day trip to the Mountain Pine Ridge area to visit waterfalls, warm swimming holes and a huge system of caves. The cave of Tunichil Muknal is a living museum of Mayan relics. Wade through water until you reach a Mayan ceremonial site. Here you will find ceramic pots and crystallized skeletons, preserved by the natural processes of the cave for over 1400 years. Today we leave San Ignacio in the early morning and head north to Belize City on a local bus (approx 3 hours). Get ready for stop and go as there are very few official bus stops in Belize and the bus will keep stopping to pick up passengers. Use this to make conversation with the person next to you on the bus; Belizeans love to talk about their country! Once in Belize City we will transfer to a water taxi. These water taxis have scheduled services to the different Cayes that are situated in the blue waters of the Caribbean sea. The water taxi takes about 45 minutes and brings us right to our next destination, Caye Caulker. Caye Caulker is an easy-going island that has a distinctly Caribbean feel. Small and friendly with a sandy main road, the only thing to do here is relax or explore Belize’s underwater worlds. Relax on the beach or head out to Hol Chan Marine Reserve, home to the magnificent Blue Hole and the world’s second longest barrier reef. Snorkel, swim or dive among the colourful corals and see tropical fish, sharks and manta rays. There is also the opportunity to go manatee spotting. These huge peaceful creatures are often called sea cows and are curious to meet their visitors. NOTE: You are free to depart at any time on the last day of the trip. Please note we arrive in Playa del Carmen late in the afternoon of the second last day of this trip. In order to make the most of what Playa has to offer, we strongly recommend that you stay in Playa del Carmen for one or two days after the trip finishes and can assist you with post trip accommodation. However, Playa del Carmen is located just south of Cancun airport (45 minute drive) so at the end of your trip you can easily head straight to Cancun airport without returning to Cancun. If you can afford a few extra days in Playa, you may want to spend time snorkelling among the mangroves or strolling along the white sands. EXTENSION: For adventures further afield take a ferry across the turquoise seas to Cozumel, and island famous for its reef diving. And for a taste of Mayan architecture, take a short trip to Tulum. These ruins sit atop a cliff amid palm fringed beaches and white sand beaches. You can even go for a swim within its ancient walls.